Much has been written or passed down through generations about our village drinking establishments, quite a bit of it inaccurate. This article is therefore an attempt to record factual historical information about not only our current public houses but also some from the past that may be unknown to readers. A very comprehensive article has been written by Mr RW Standing on this website about The Lamb and therefore it is not proposed to repeat much of this information. You can read Mr Standing's article by clicking here. It has sometimes been said that present Lamb had its origins in the 16th or 17th centuries, primarily because it features a large Charles I or Charles II iron fireback. Such items are, and were, easily moved from one location to another. Records suggest that The Lamb was built c1780 and this is supported by the architecture and the materials employed in the building. There is no evidence that there was an earlier inn on this site. Notwithstanding that, The Lamb has been Angmering's principal watering hole for over 225 years. There seems much evidence that the building has undergone many changes and additions over the years. 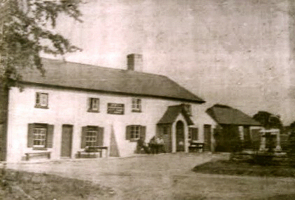 A number of photos exist of the inn at the end of the C19 and early C20. The frontage has changed relatively little since that time but it is impossible to see from these what changes may have been made to the rear of the property. From sketches made by retired architect Douglas Wilkinson, grandson of the legendary licensee, Thomas "Old Wilkie" Wilkinson (1826-1909), there certainly seems to be a considerable number of changes today to the ground floor layout from that which existed 80 years ago. The Lamb always had competition from the older public house, The Red Lion (probably the original Lamb Inn built c 1740), but The (new) Lamb’s facilities were probably superior which allowed village organisations and those from further afield to meet and dine in some comfort. It was the upstairs clubrooms that provided this spacious accommodation. During the 19th century, a room by the archway leading to the stables was used as the village mortuary, and later when the roof over this part of the property was being repaired, a small attic room was discovered which may have been used as primitive overnight accommodation for post-boys and by the grooms who serviced the daily horse-drawn coaches which came into Angmering. By about 1908, the public house was described as “The Lamb Commercial Hotel” and among its facilities were stabling, hire of carriages and the catering for small and large parties. The Lamb was eventually bought by Punch Taverns but trade declined to such an extent that the pub closed in 2011 and put up for sale. 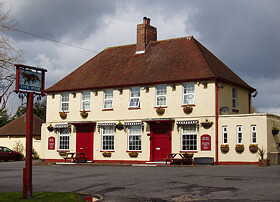 It was purchased by the local Newbon family and, after substantial investment and renovations, opened as "The Lamb at Angmering" in April 2012. Further development and improvements of The Lamb continued for the next four years. 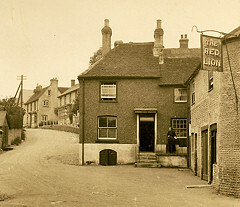 The Red Lion was located on the east side of The Square at the foot of the High Street in the buildings occupied today by Woodies News and the Angmering Parish Council Office. Again, while the history of The Red Lion is a bit vague, it is covered largely by Mr Standing's article on it and The Lamb. What is interesting is the conclusion that The Red Lion had probably been known as The Lamb until the present Lamb opened in c1780. Rates records in the later part of the 18th century refer to both the Old Lamb (believed to be what was to become The Red Lion) and the New Lamb which implies that the Old Lamb must have been in existence for some years before the present Lamb opened its doors. However, there is insufficient evidence to suggest that the earlier inn had opened any earlier than the mid-18th century. By 1832, the inn had been acquired by the local brewers, Messrs Henty, who appear to have retained ownership from that point on until the hostelry closed in about 1932. It has been stated that there was a building on this site since 1540 and, indeed, this may well have been the case. However, architecturally, the current building only appears to be Georgian. The earliest general map of Angmering, Yeakell & Gardner c1780, does show a square building on the site but that may be a previous house. There are suggestions that before becoming an inn, it was a butcher's shop, but this has not been substantiated. The first evidence of it being a drinking establishment is found in the 1861 Census when it appears to have been only a beer shop. The occupier, George Baker (32), was described as a beer shop keeper. Angmering historian, Edwin Harris (1866-1942), states in one of his works that The Spotted Cow was first licenced in 1860. It has also been suggested that the house was a haunt for smugglers in the 18th & 19th centuries who used a ceiling mounted spinning device with an arrow head at one end as a mechanism for dividing contraband. This seems rather fanciful and, bearing in mind that the days of smuggling were over before the Spotted Cow came into being, it would seem strange to mount such a device in a private house. While this seems an interesting tale, it is more likely that this "Spinning Jenny" was simply a gaming device introduced when the building became a beer house. The first evidence of The Fox being a public house is found in the Rate returns for 1797 when it was probably owned and run by William Coote. The house, however, may well have had much earlier origins. While it is possible to trace owners or licensees, no anecdotes and little information is known about this establishment. However, by 1846 it was owned by the Pechell family of Castle Goring. What we do know, however, is that the current Fox was not the original inn. 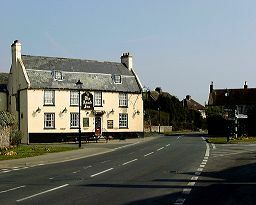 The present public house was built immediately to the east of the old inn and opened on 30 October 1951, and the old inn was demolished soon afterwards. Of more interest is its location. While today it styles itself as "The Fox at Patching", most of the pub is in Angmering, the boundary actually running through the rear of the pub, that northern part being in Patching. So little was known of this beer house until recent years, that it has often been confused with The Woodman Arms at Hammerpot. The full known history of The Leather Bottle has been written by Mr RW Standing and can be read by clicking here. Mr Standing writes: "In both 1841 and 1851 Edward (Hoad) was the occupier and, indeed, in 1851 was referred to as a "beer shop keeper". That is a rather of more lowly status than an inn. After that nothing more is said of the beer shop, and between 1861 and 1881 the occupant was Charles Puttick, an agricultural labourer and woodman. How much longer the cottage stood on the site is as yet uncertain. It is not there today, although the verge where it stood can be found, perhaps with some trace of the foundations under the turf". In his 1914 "A Short History of Angmering", Edwin Harris wrote "Bernard, Duke of Norfolk acquired the entire northern half of Angmering. Away to destruction went the mansion and clock tower......... and the quaint and ancient "Leathern Bottle Inn". The house mentioned was Michelgrove. Harris does not actually say that Bernard (12th Duke) ordered the destruction of the Leathern (sic) Bottle; as Bernard died in 1842, it seem likely that a later Duke may have been responsible. This is yet another inn said to have been operating since the 16th or 17th centuries, but again there is no known evidence to support this. There is no doubt that parts of the building may have been 18th century or possibly earlier. Suggestions are that it was granted an ale licence in "about 1740" - this implies that there is no hard evidence that this was the case. It was not until 1962 that a full wines, beers and spirits licence was applied for. It certainly sold beer in the latter half of the 19th century but may have only opened after the closure/demolition of The Leather Bottle in Dover Lane. A tale that Charles I stopped at the inn for breakfast when fleeing the Roundheads is again very fanciful and without any evidence. Indeed, his suggested route passes many miles to the north. At the 1851 Census, none of the occupants were linked to selling or brewing alcohol and it is not until the 1871 Census that we first learn that it was occupied by William Mansell, a beer shop keeper. Exactly when the establishment first acquired the name "The Woodman Arms" is unclear. Kelly's Directories did not include the name in their lists until some time after 1946 although the name appears to be first mentioned in the 1881 Census. 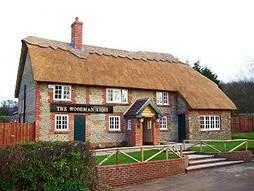 Tragedy struck the public house on the evening of 26 February 2004 when The Woodman was burnt down after a fire started in the thatch of the Grade II Listed Building and only the main chimney breast and a part of the south extension were able to be salvaged. Through the efforts of the then owners, Gales Brewery, the pub was re-built as an almost exact replica of the original building and re-opened on 4 February 2005. 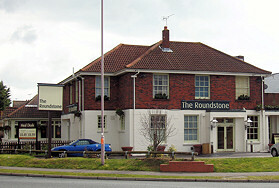 Angmering's newest inn is The Roundstone which opened in 1939 and cost £7,000 to build. It was granted a provisional licence in the May of that year. Of course, it has little history and was built as a modern road house. A "conservatory" type extension was added in the 1994 and a 20-bed Premier Inn adjoining it opened its doors on 2 January 2008. The name is derived from a mill-stone which lay on the grass by the crossroads at the southern end of the lane (about where the level crossing is now) but it had disappeared by the early 20th Century. Legend has it that the mill-stone rolled down the hill from one of the mills on Highdown killing a man on the Worthing Road! Less is known about this inn than probably of all the others in Angmering (apart from the Leather Bottle). Suggestions are that it was a 16th century building that may well have ceased operating as an inn well before the end of the 18th century. A military survey of 1686 records an inn in Angmering and this may well have been the Rose & Crown. Mr RW Standing notes that "the Rose & Crown is recorded in the early 18th century, when owned by the Penfold family, paying a quit rent and heriots". In the 1702 Probate Inventory of Richard Sturt's property in the High Street, almost certainly on the site of the Rose & Crown, a brew house existed with brewing equipment and the cellar contained 26 kilderkins full of beer (equivalent of over 3000 pints!). There were also 4 pewter chamber pots in the hall - no private toilets in those days! 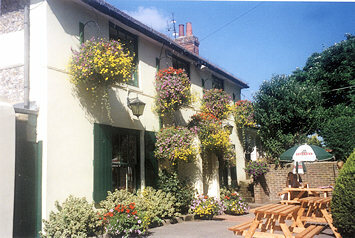 Edwin Harris suggests that the Rose & Crown may still have operated as a "bough" house, i.e. a temporary beer house, operating during the annual Angmering hiring fairs that came to an end in the 1830s. In her memoirs of Angmering, Grace O'Neill implies that the building was demolished circa 1914. After it had ceased as an hostelry, it was converted to three cottages at a point no later than 1836 (per deed) and perhaps much earlier. One very heavy 18" beam ran the whole length of the building. The floors consisted of large thick, worn and uneven flag stones. At the time of demolition, Grace noted that there was an enormous chimney which held spikes on which the boy chimney sweeps climbed to clean off the soot.